Lee Oliver from our Marketing Department makes our recycled tissue paper bloom! She must have quite the green thumb because the blossoms are just enormous. Imagine a Jurassic Garden indoors! Hanging from the rafters of your shop or your window display, decorating a wedding reception or baby shower, adding fun to a child’s room or birthday party, they’re delightful. And little ones are spectacular on gifts. I’m sure you will think of other uses for our solid tissue paper and printed tissue paper. Comment below and tell us what you have done with tissue poms. Click here to learn how to make tissue paper flowers & tulle poms! 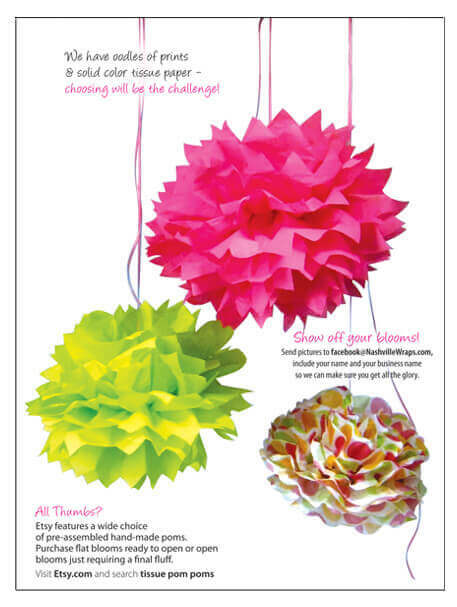 Thanks for this wonderful idea of creating tissue POM POM flowers. I am getting married in Haiti in moving their to serve as a fulltime missionary alongside by beloved. We are on a non budget for our wedding so I have started creating this easy to make flowers to add some fun and color too our special day. Blessings and thanks again. I’ve made these for years…small, medium, large. I’ve been recently making them to decorate a booth I’m opening at a new Public Market here in Knoxville. We’re putting them all around the top of the booth. My products include tutus, halos, butterfly wands, etc., all for little girls. They look fabulous! I think these are a fab idea. I shall be making them by the bucket load to hang in trees in the garden for our Hawaiian Party next week. Making lots of tissue flowers to hang upside down from ceiling for a wedding receiption. I think it will look great. This is a hard one. Unless you have some sort of die press I think you are stuck with uneven edges but honestly, when the tissue is fluffed they are not noticable. I love this idea. I made a lot of these flowers for my daughters first birthday. But I only had a few sheets of tissue paper because tissue paper is hard to come by in the Solomon Islands so I improvised and recycled brightly coloured plastic bags. I just had to cut the plastic bags in a such a way that they were all the same size and same dimensions as the instructions above. One plastic bags makes about two sheets. You would need 4 large plastic bags for the big ones and only two to make medium ones. 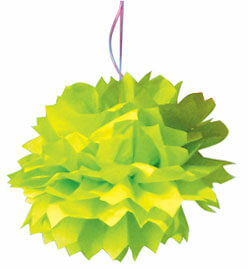 Using plastic bags makes the pom pom look just as beautiful as making the it with tissue paper. Gold Mylar – I would have never thought of that. Thanks for your good ideas. WELL, MORE THAN TEN YEARS AGO, I MADE THESE FLOWERS OUT OF GOLD MYLAR THAT I BOUGHT FROM YOU ON ROLLS AND CUT THEM TO 12 X 12 SIZE SHEETS AND USED THEM AS PROM TABLE CENTERPIECES ATOP A CRISS CROSS OF BLACK RIBBON WITH CONFETTI SPRINKLED ON TABLECLOTH. WE WERE THE TALK OF THE TOWN AND THEN I USED 36 X 36 ONES FOR WALL DECORATIONS……THERE IS NO END TO WHAT YOU CAN DO WITH THESE. JUST LET YOUR IMAGINATION GO WILD…..IN FACT, I STILL HAVE THOSE MADE WITH THE MYLAR AND WE HAVE USED THEM IN MY SISTERS CATERING SERVICE, AT 50TH WEDDING ANNIVERSARIES, RETIREMENT PARTIES, VALENTINE’S PARTIES…….AND THEY JUST NEED TO BE FLUFFED AND THEY ARE READY TO GO. Oh my gosh! This is how we always decorated our floats for parades. Most people cannot afford to use real flowers, so we always made thousands of tissue flowers just like the ones above. In fact, we would have flower making parties because generally you need specific colored flowers to create your float design. Then you simply attached the flowers to your 3-D form structure which was usually covered with chickenwire, e.g. ensuring that your form or shape will be completely covered with flowers. 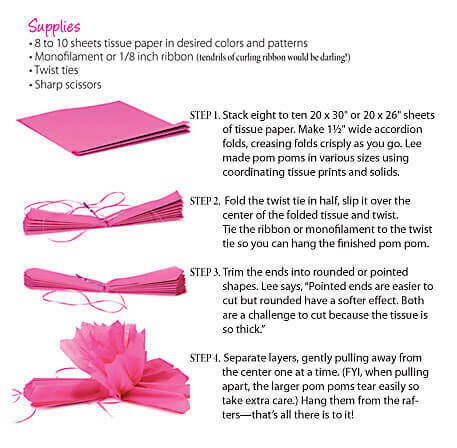 I’ve been making tissue flowers for a variety of projects ever since. I think we should try it and post the results of our experiment. They would be beautiful if it would work. i wonder if these pom pom flowers could be made out of tulle? What a good idea, Valerie. I might do that next time I mail a gift. What a cute and doable idea! Wouldn’t these be great to use as space fillers in mailed packages? The recipient would be surprised with a bouquet upon opening the package and the flowers would help cushion the contents of the box.